The spreadsheet is perhaps admirably straightforward. 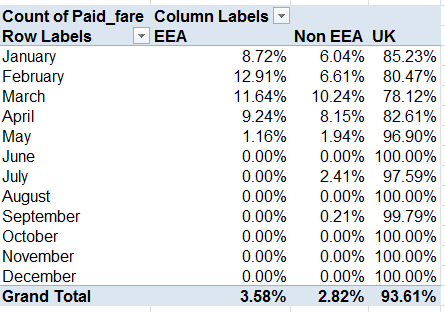 I was preparing to dismiss the Departure field in column C for its at-first-blush redundant character, appearing to roll nothing but “UK” entries across its cells, but in fact 79 entries in the field offer up something other than UK, e.g., EEA (the European Economic Area, an organizational composite enrolling European Union and European Trade Association members), and Non EEA embarkation points. And therein is promoted a measure of mystery. The data’s departure and arrival points are drawn in the most general terms, and one could properly wonder if that manner of indefiniteness means to divert the reader from exactly where the Home Office has been taking itself. That could be, but an enterprising journo could perform a bit of triangulation by correlating departure date, airline, and flight fares in order to educate a guess about the airports associated with those departures and/or destinations, and all with information unambiguously and publically there on the workbook. Nothing treasonous there – I think. But if I’m wrong about that, I need to finalize that reservation at the Ecuadorian embassy. Considerable inter-month variation obtains; how that squares with the rhythms and syncopations of policy-making remains to be considered. Note that March hands in the dearest expense report, but trip count honors go to November, at 1128, or 37.6 a day. 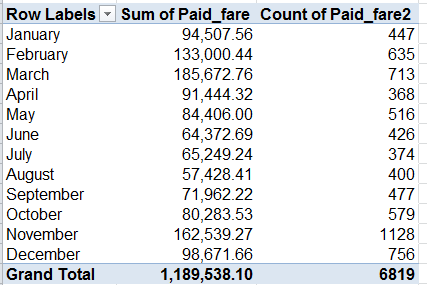 Those disparities put Marchs’s per-trip average at £260.41, and that for the eleventh month at £144.10 (I couldn’t output the averages via a calculated field, but I’m still thinking about why not and how the why the might be articulated), begging more than a few questions in turn. For one – rather than having traveled farther distances on average, is it possible that March’s passengers were more likely to have taken off from a seat in one of the upper classes? Click On for Columns Only among the Grand Totals option in the Design> Layout button group. That adds a jot of definitiveness to the query. March’s Business Class-ruling £993.28, far higher up the axis than any other month save Aprii, appears to account for its dilated overall fare average. Note in addition the very substantial January-May Business Class averages and the commensurate fall-offs, timed with June. It’s easy to be struck by the Home Office’s near-absolute moratorium on non-UK-destined flights after May. Indeed, no such sorties toward EEA nations streaked down any runway after that month. Of course I can’t explain the EEA front-loading in 2011; It would prohibitively difficult to point to an Office strategic deliberation to fly to only certain venues, and only then; one would think the commanding political exigencies would goad the flight patterns instead, if there is a “pattern”. We’ll need to pass this one over to you, Mr. and Ms. Journo. 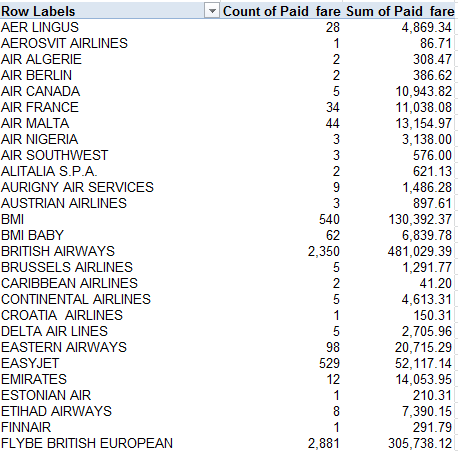 55 airlines figure in the manifest, and these data require a bit of study as well. Note the unsurprising hegemony of the British-based British Airways and Flybe (along with BMI and BMI Baby, neither currently trading, as they say here). Again, exactly how these plot against destinations might take a bit of reflection, or more than a bit. So fasten your seat belt.